The rive droite of the Argentière Glacier The Icelander and Frénésie walls. 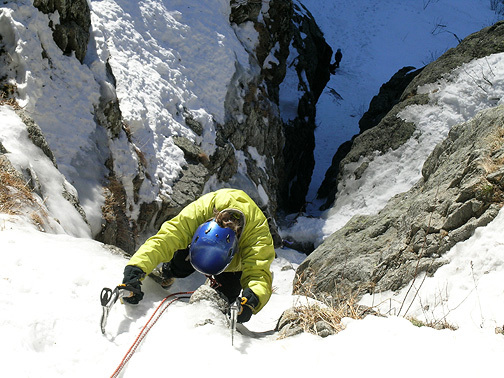 In addition to the fantastic mountianeering to be found Europe, in the cold of mid-winter the mountains of the Alps also offer great waterfall climbing. 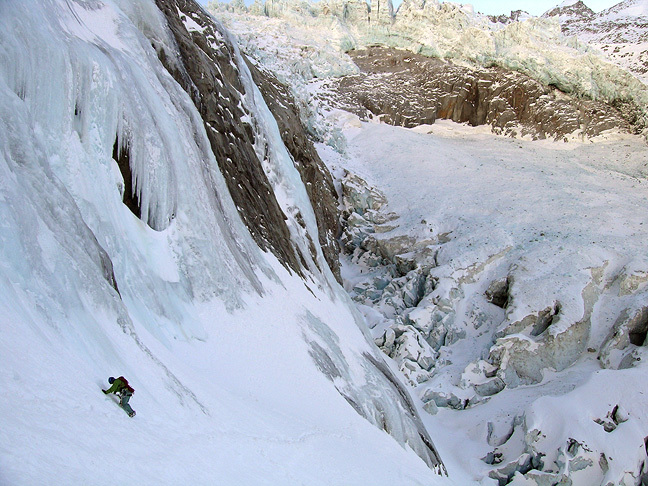 There are many areas, but on this page we concentrate on the best waterfall climbs reasonably accessible from the Chamonix Valley. There are so many climbs that the guidebook is poblished in a two-volume set. 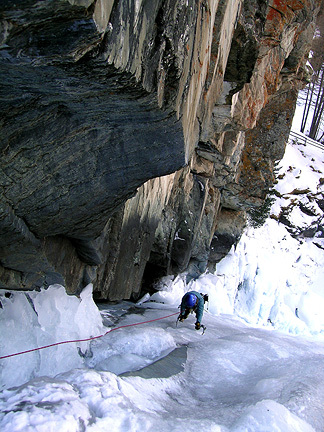 In addition to the many frozen waterfalls, there are also many mountain gulley routes climbed in the winter season. The easy access via cable-car leads to often short approaches to these high routes. Often descent is made by rappel to skis or snowshoes left at the base. Generally the best season for waterfall climbing is during the coldest part of winter, usually from December to the end of February. But the routes at higher elevations can be good all throught the spring and even into summer. In the Chamonix Valley itself, there are a number of good climbing spots. The biggest and best is found on the cliffs above the right and left banks of the Argentière Glacier. Here there are many routes, some of them quite long. Most of the climbing in this sector is of grade 3+ or harder, with the majority of routes in the 4 and 4+ range of difficulty. Also near the Argentiere Glacier, but lower in elevation is the popular Crémerie. This is a great training area with many moderate lines and easy access. A quick trip throught Mont Blanc tunnel into Italy brings us to the Val di Cogne. There are dozens of routes here, at all grades. One of the best and mot popular is the classic Cascade de Lilaz–some 5 to 6 pitches up a scenic winding gully. 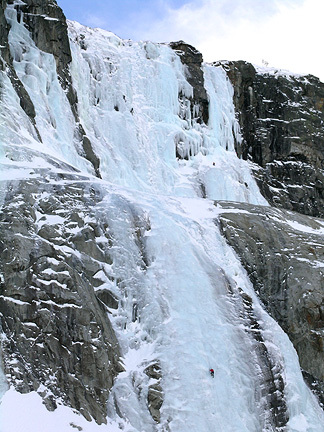 As with all waterfall climbing, in the Alps the best strategy seems to be to choose objectives that work best with the current weather, ice and avalanche conditions. Rather than choosing particular objectives in advance wait until your arrival and see what looks particualrly good and attractive. The exit of the narrow Goulotte on the rive gauche of the Argentière. A panorama of the entire rive droite of the Argentière Glacier. Appraching the ice above the Argentière Glacier.